Is spraying for West Nile virus safe? With nearly 700 reported cases of West Nile virus nationwide, health officials say this is the worst season for West Nile in eight years, and ground zero for infections is Texas. NBC's Janet Shamlian reports. Texas state health officials, alarmed by the worst outbreak of West Nile virus since the infection first hit the United States in 1999, started spraying insecticide from airplanes Thursday night. Years of research show the poisons being used in the spray are safe for humans — and certainly safer than the virus, health officials said. But blogs and social media lit up with concerned comments from people afraid the insecticide might hurt them, their children or other creatures in the environment. “This is not science. It is ignorance, fueled by chemical corporations seizing the opportunity to poison everyone,” Judith Winchester, a Dallas-area designer, posted on the North Texas Poison Center 's Facebook page. The poison center and state health officials, as well as the Centers for Disease Control and Prevention and the Environmental Protection Agency, say the spray being used is about as safe as an insecticide can be. Called Duet, it’s made up of two products, both synthetic versions of a chemical made by chrysanthemum flowers. 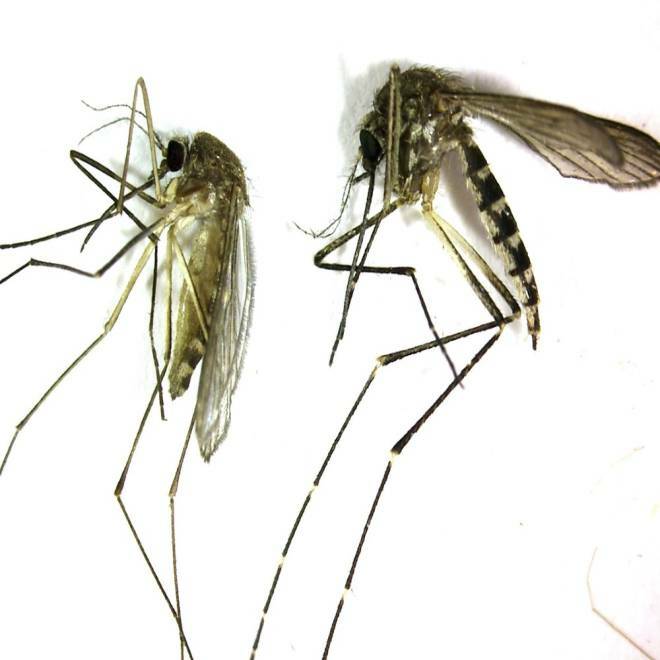 Culex pipiens, left, is the primary mosquito that can transmit West Nile virus to humans, birds and other animals. The bite of this mosquito is very gentle and usually unnoticed by people. At right is an Aedes vexans. It is a very aggressive biting mosquito but not an important transmitter of disease. Insecticides first got a bad name back in the 1960s, when it became clear that DDT was killing birds by thinning their eggshells. Then it turned out it was a likely cause of human cancer, too, and it was banned in the U.S. in 1972. And because so many insecticides are nerve agents, they have worried doctors, environmentalists and the public. There’s one class of pesticides called organophosphates that do appear to damage the nervous systems of people who get exposed to high amounts — farm workers, for example. But the pyrethrins in Duet — that’s their chemical name – are formulated differently and work through a different mechanism. They kill mosquitos in very low doses. And they don’t affect mammals, humans included, in the same way they affect insects. According to the National Pesticide Information Center (NPIC), a joint venture between Oregon State University and the EPA, pyrethrins work by blocking the nerve activity of insects and they kill adult mosquitos by direct contact. But they’re not as dangerous to bigger creatures, even birds. “Pyrethrins are one of the least poisonous insecticides to mammals," the center says on its website. They break down quickly into inactive forms in the body and don’t build up in the soil. They do, however, kill honeybees and can poison fish and other aquatic life. That’s one reason that Texas is spraying at night – to minimize the effects on bees, butterflies and other beneficial insects. They are used in pet flea and tick preparations and in lice control shampoo for humans. The EPA says they don’t cause cancer and don’t hurt pregnant women or their unborn babies. Compare this to West Nile, which has made 30,000 Americans sick since it arrived in the New York City borough of Queens in 1999. “The 693 cases reported thus far in 2012 is the highest number of West Nile virus disease cases reported to CDC through the second week in August since West Nile virus was first detected in the United States in 1999,” the CDC says. West Nile itself isn’t especially deadly — only about 20 percent of infected people even know they have something, other than perhaps a mild cold. And most who develop symptoms get what’s called West Nile fever, which has the typical symptoms of many viruses — fever, headache, tiredness and, sometimes, a rash. But 1 percent of cases get severe disease, usually meningitis, an inflammation of the spinal cord, or encephalitis, which is inflammation of the brain. These are usually older people are patients with suppressed immune systems. These symptoms can kill quickly or leave people with nerve damage such as paralyzed limbs. There is no human vaccine for West Nile — there’s one for horses — and no real treatment. People with severe infections get supportive care such as IV fluids to make sure they don’t die of dehydration and breathing support if the nerve damage affects their ability to breathe. The other chemical used as a defense against West Nile is DEET, an ingredient in the most effective insect repellents. It seems to stop mosquitoes from smelling their human victims. The NPIC says it’s very safe for people. “Nearly all of the DEET that is taken in through the skin is eliminated by the body within 24 hours of applying it,” the center’s website says. It also does not cause cancer and has been used safely by pregnant women. And the department says spraying is only part of the answer to the problem. People need to cover up, use insecticide and,most of all, control standing water to stop mosquitoes from breeding. Even a small amount of water in a potted plant can provide a breeding ground for mosquitoes.